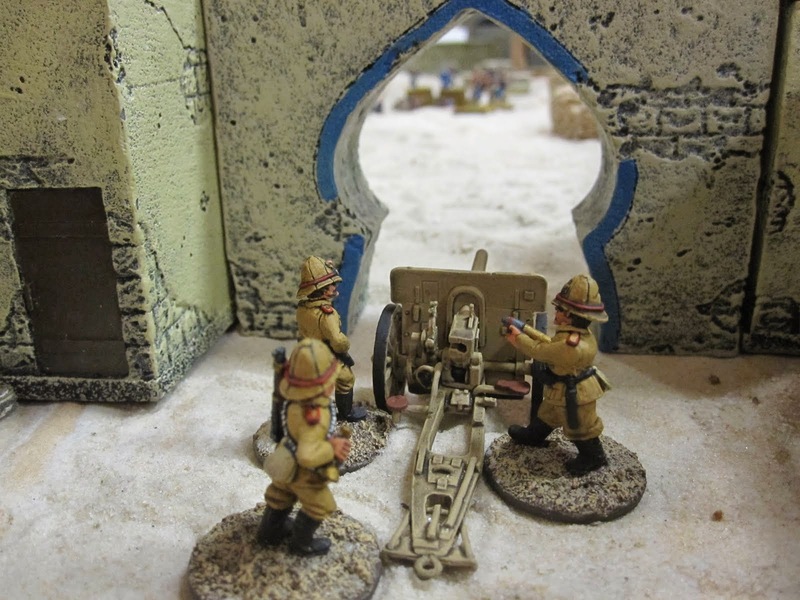 Below is an AAR from Bill Moreno about a recent game at SMG's new gaming club house. 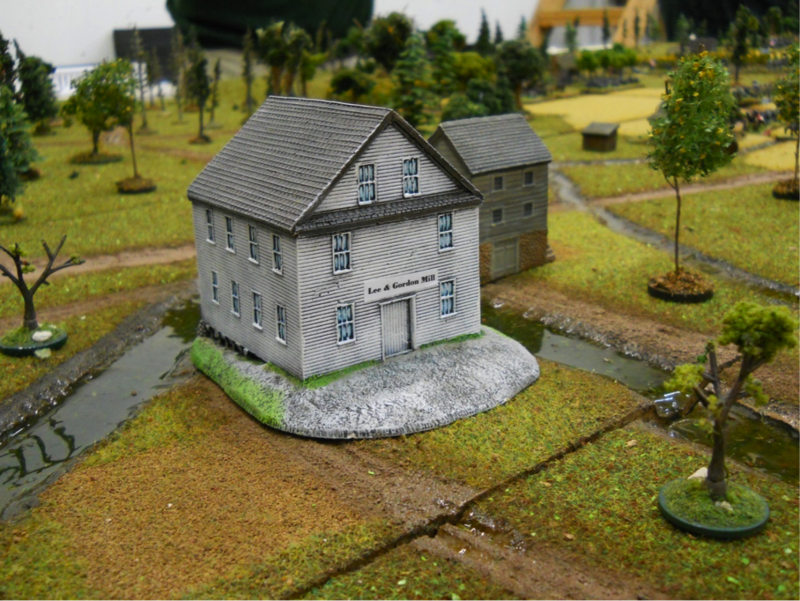 The War House or Das Kreig Haus! 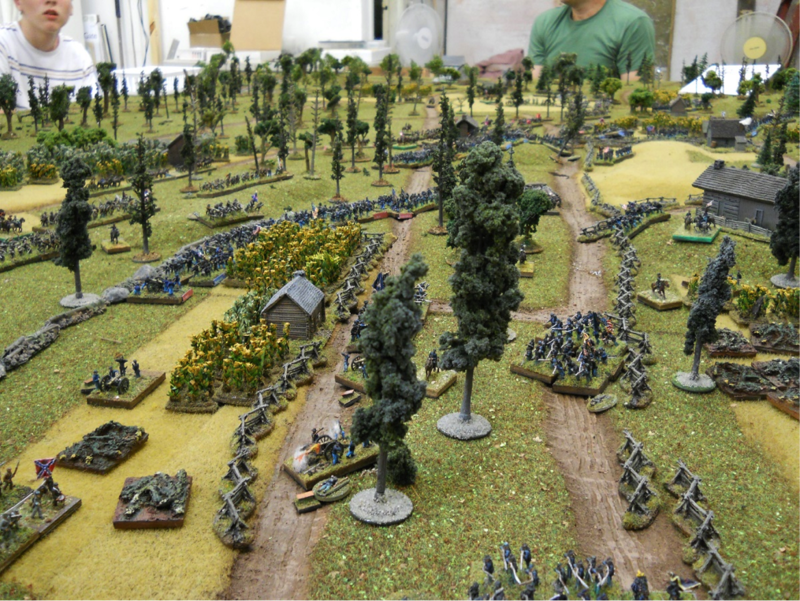 This battle was fought out over a weekend with multiple club members showing up for either one or both days. Here is a view of the entire table from the loft. All the green areas are woods which restricted everything, ie - movement, sighting, and fire combat. Bill Moreno on the right and Bill Pritchard on the left. 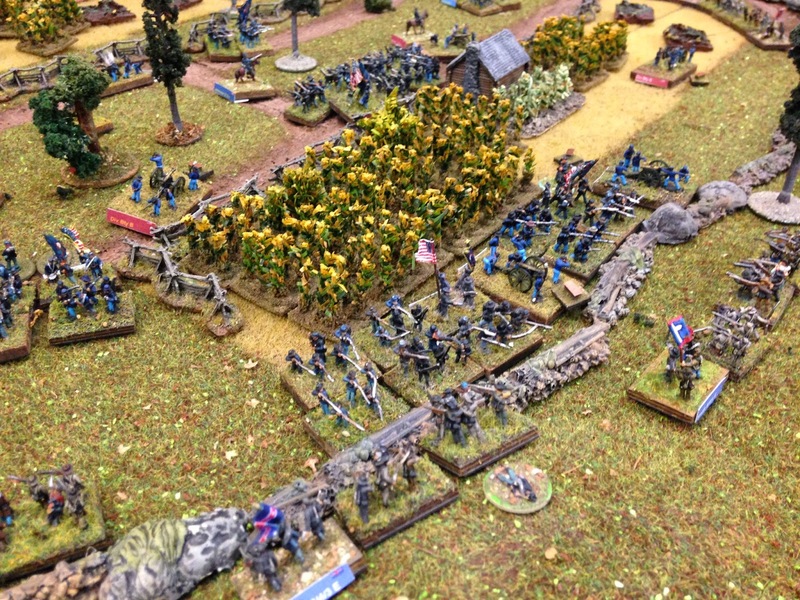 A close up of the Rebs attacking the Union position. 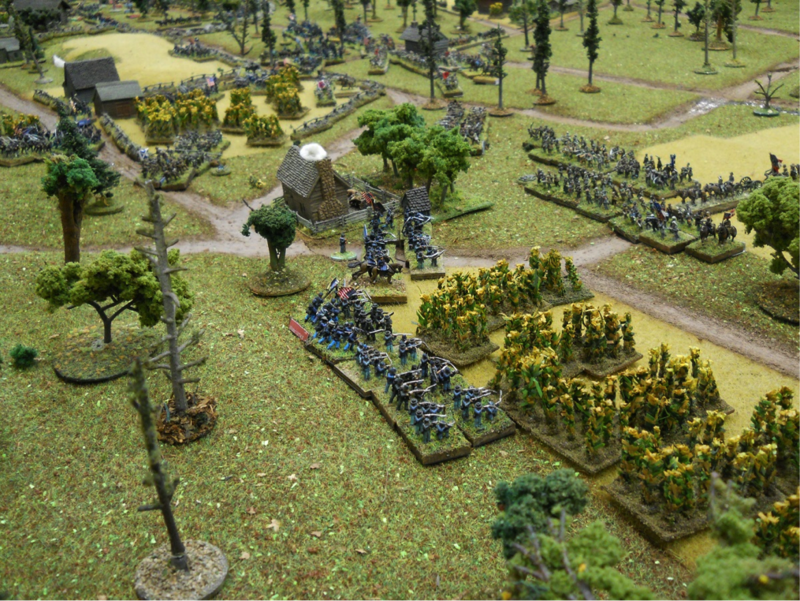 A view from the edge of the woods looking at the Union troops manning their position prior to an attack. 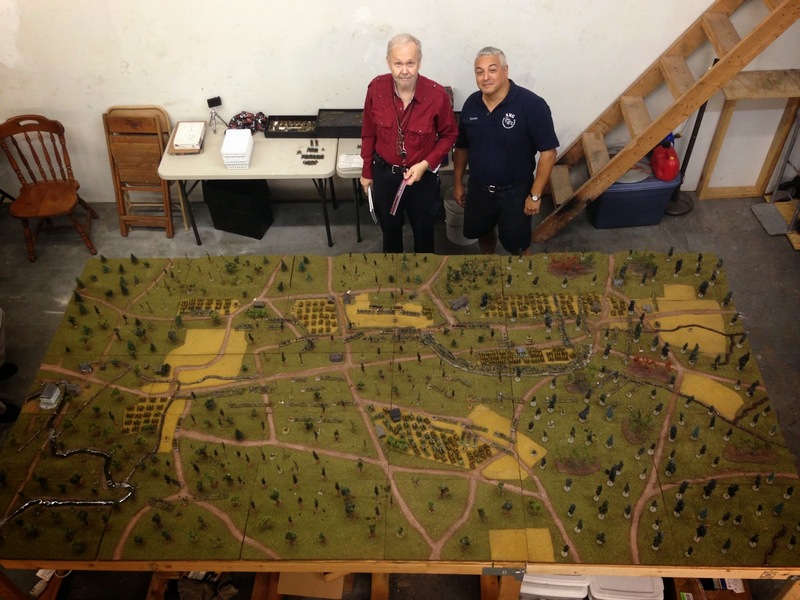 As promised, here is the AAR for our club's annual ACW Weekend. 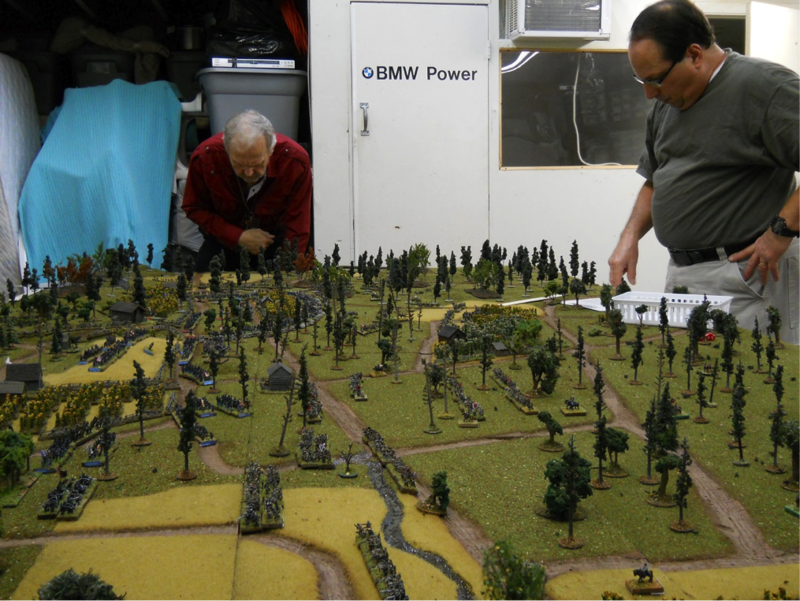 This year I ran Chickamauga using the classic Fire & Fury Scenario. Here is the AAR, picture book style. Opening moves contemplated by CS Command, club members John Rosasco on left played Bragg and Bill Pritchard on left played Bishop Polk. 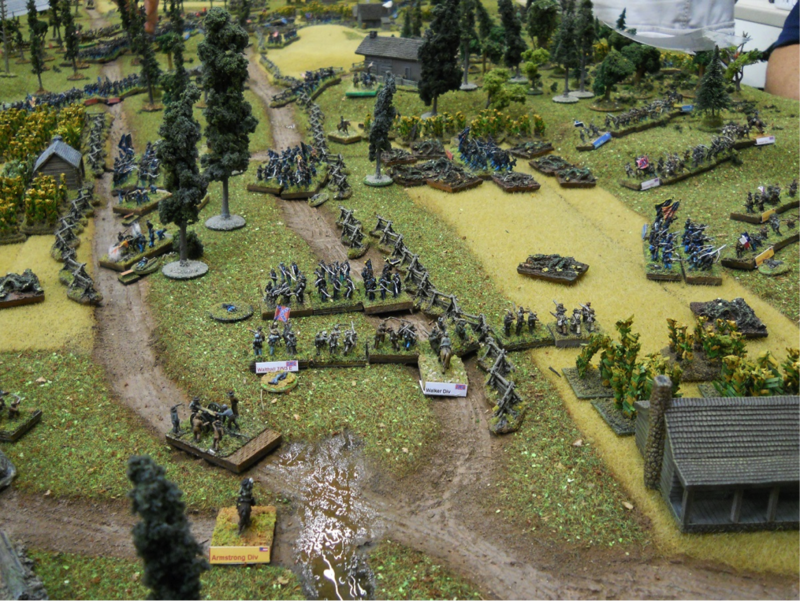 CS Left advances against Wilder's brigade. 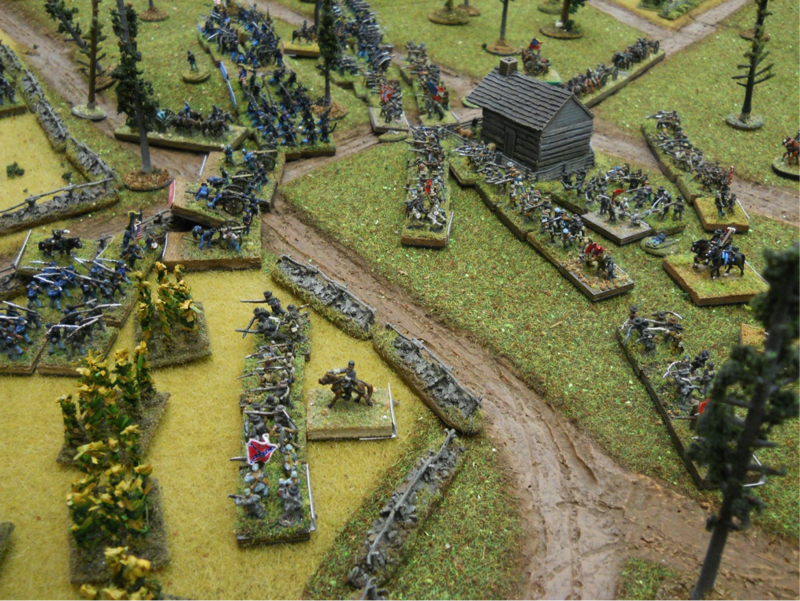 They lost three stands immediately to the Spencer-armed brigade. 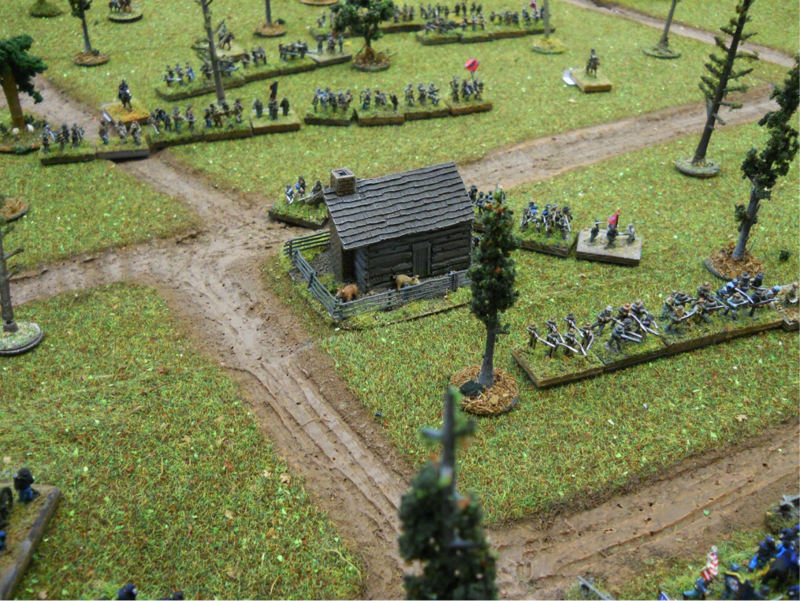 Confederates advancing past the Brotherton Home. 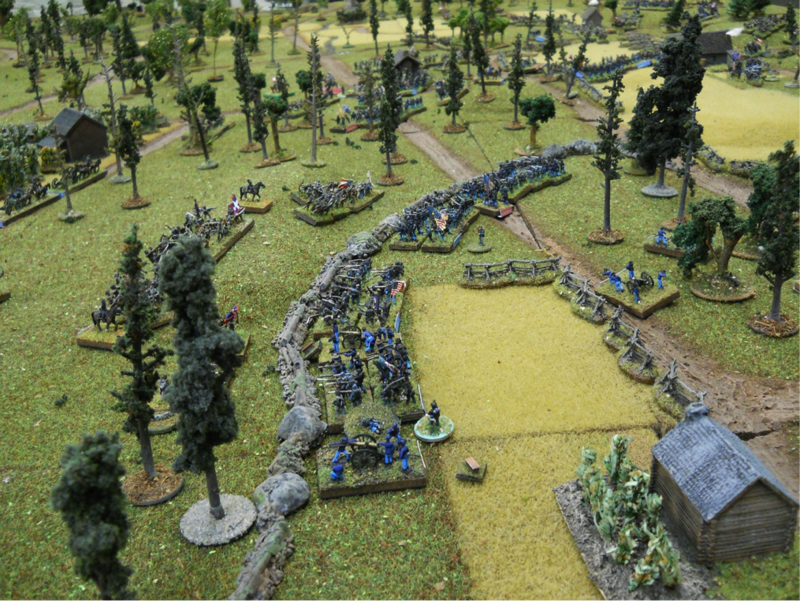 Heavy fighting around the Brotherton home saw the Yanks getting the worst of it early on in the battle. 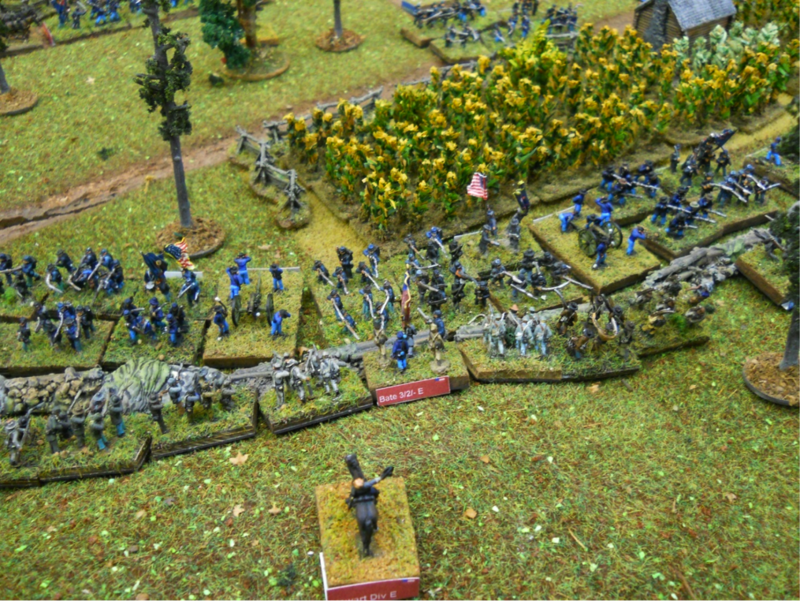 AP Stewart's Division advances in the center. He attached himself in one of the melees and was captured. 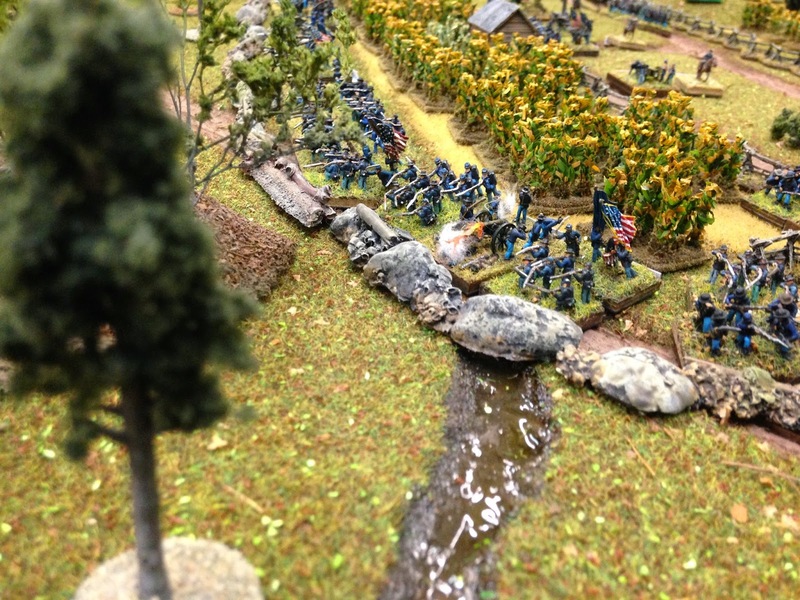 States Rights Gist's Division about to hit the Yanks left flank. 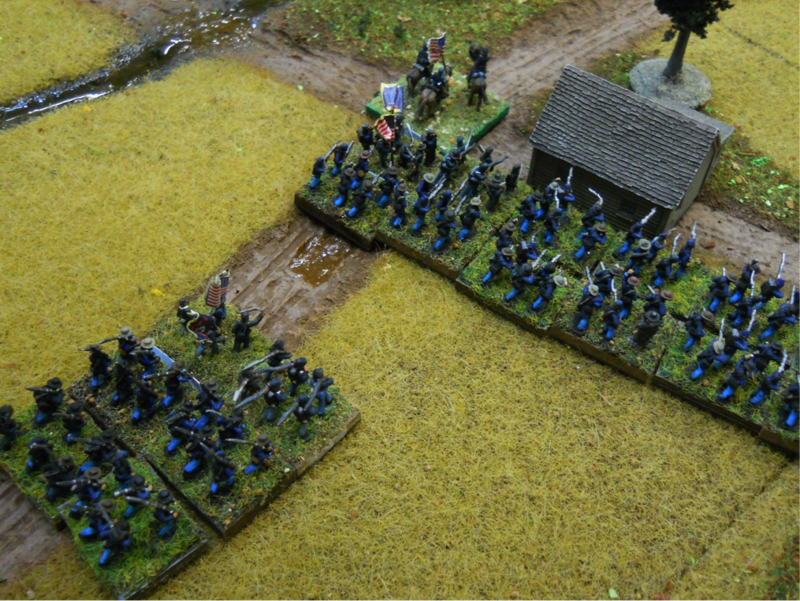 No action took place around the mill as the Yankee right was quickly bent back towards the center. Wilder slowly pulled back while a timid Confederate brigade still picks the lead out of their shell jackets from the first round of combat with Wilder. CS advances in the center suffered from poor dicing on both days of the event. 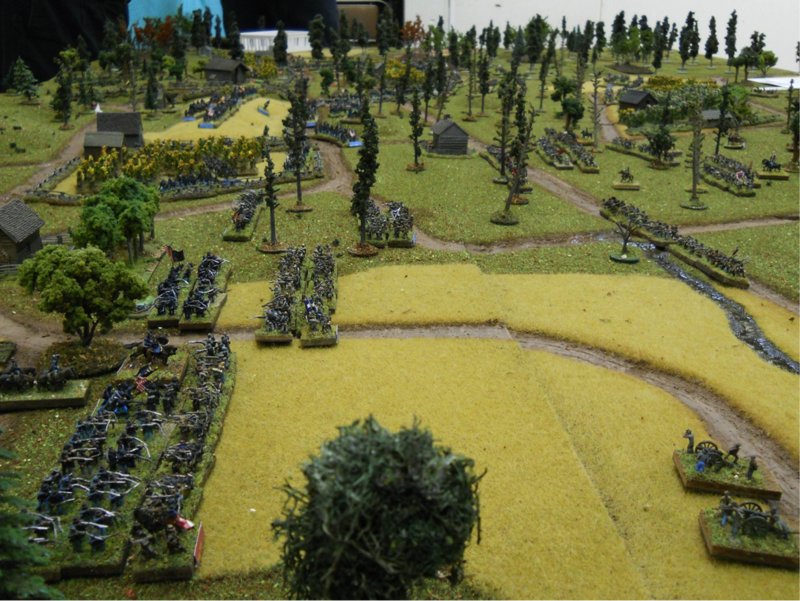 The Yanks were able to pull troops out of the center and send them to their left, which was under heavy pressure. 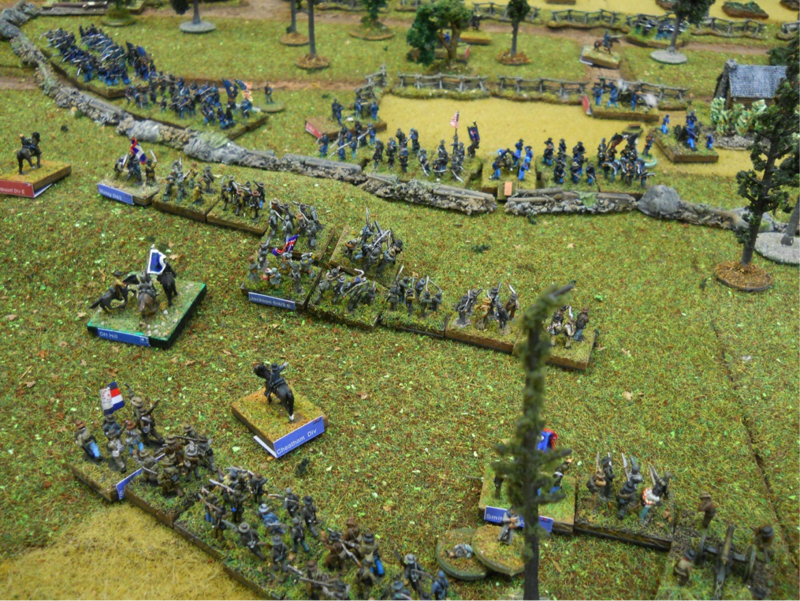 A view of the center and left shows the exposed flank and heavy fighting off to the Union right. 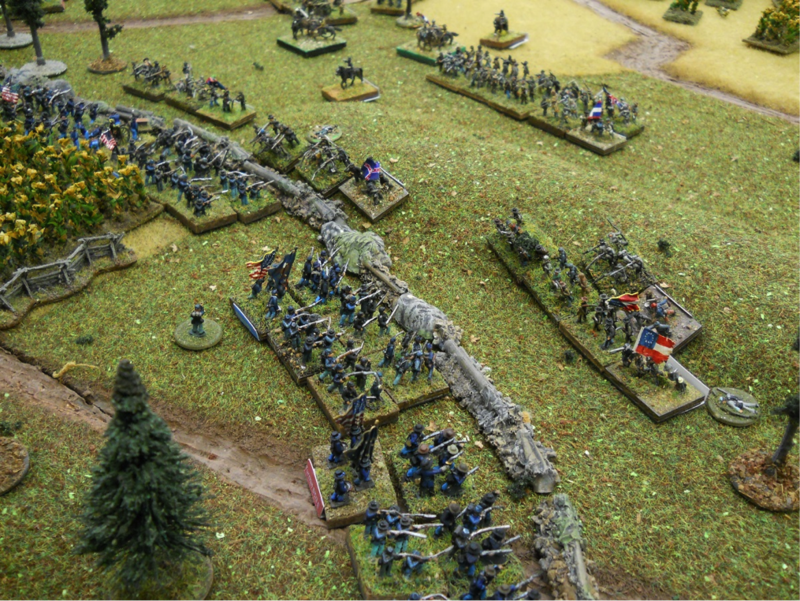 Constant action on the Union right made for some heavy casualties and weak combatants on both sides. The fighting goes to and fro on the US right. 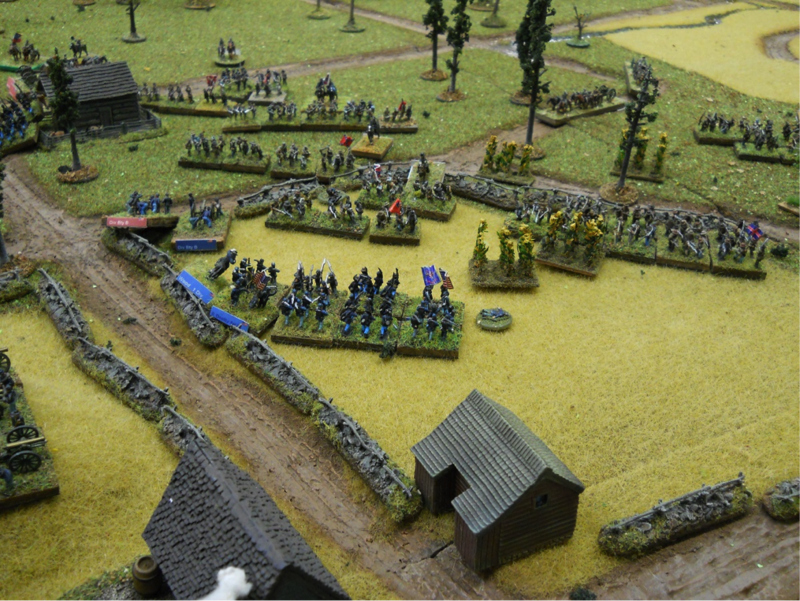 Neither side was able to gain a decisive advantage for much of the game. Chaos for the Union left! 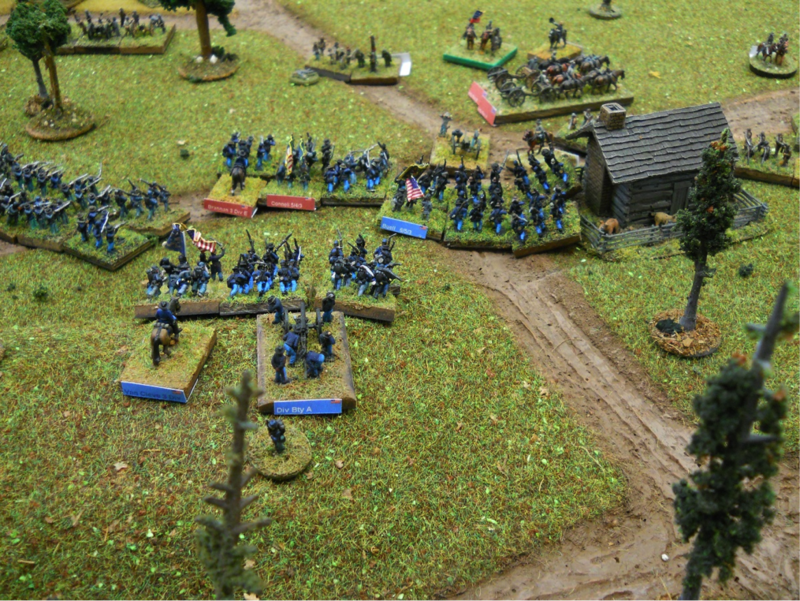 The CS player has troops in the Yankee rear atop Snodgrass Hill! 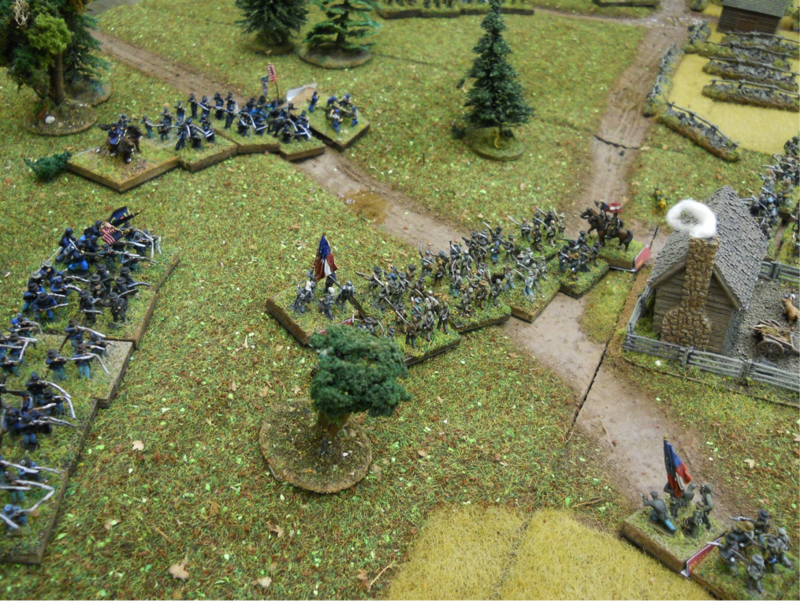 A US Counter-Attack on the right regains the Lafayette Road for the time being. 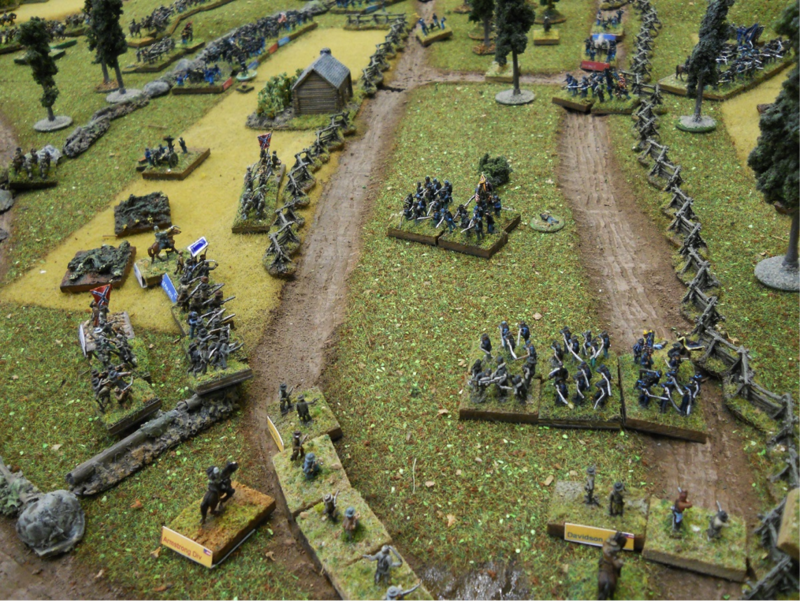 Confederates counter the Yankee thrust and bend the Union Line back upon itself again. 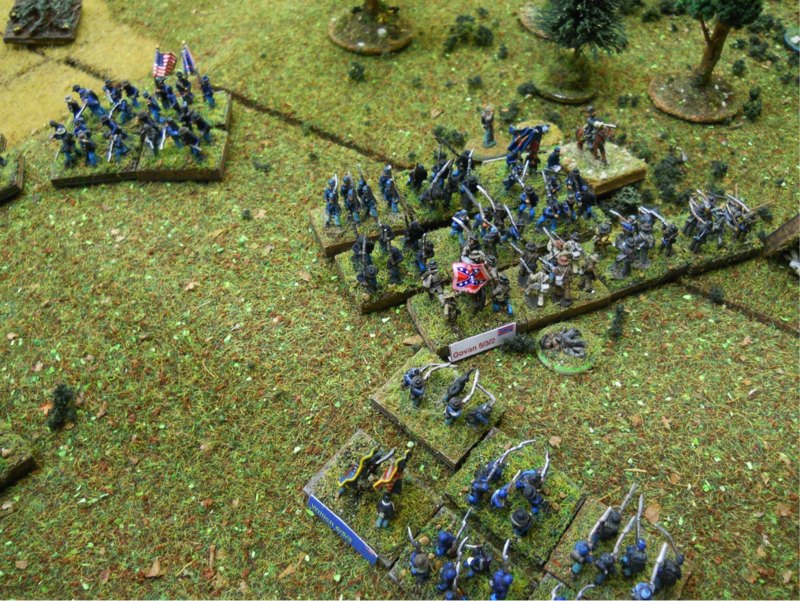 Wilder re-engages at a critical moment causing more Confederate casualties. 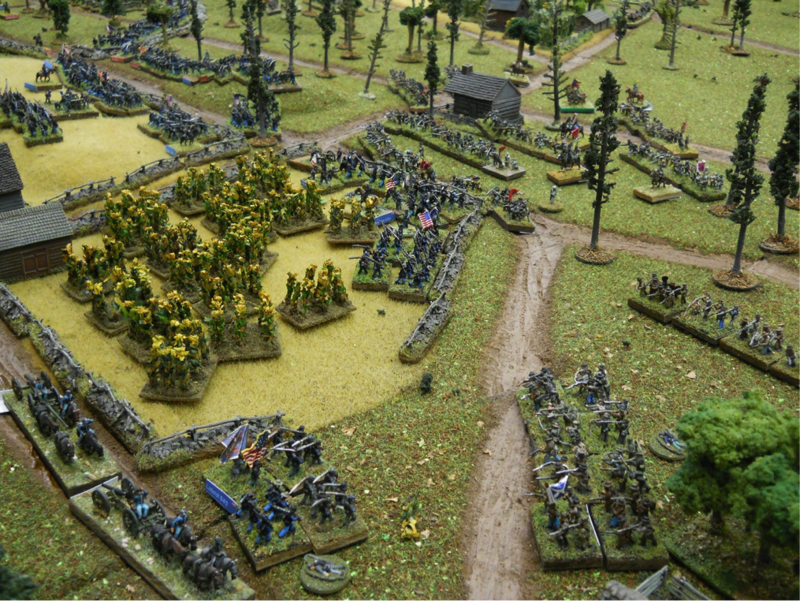 The Yanks are able to regain stability on their left with some localized counter attacks. The CS player in the center again has no luck with dice. 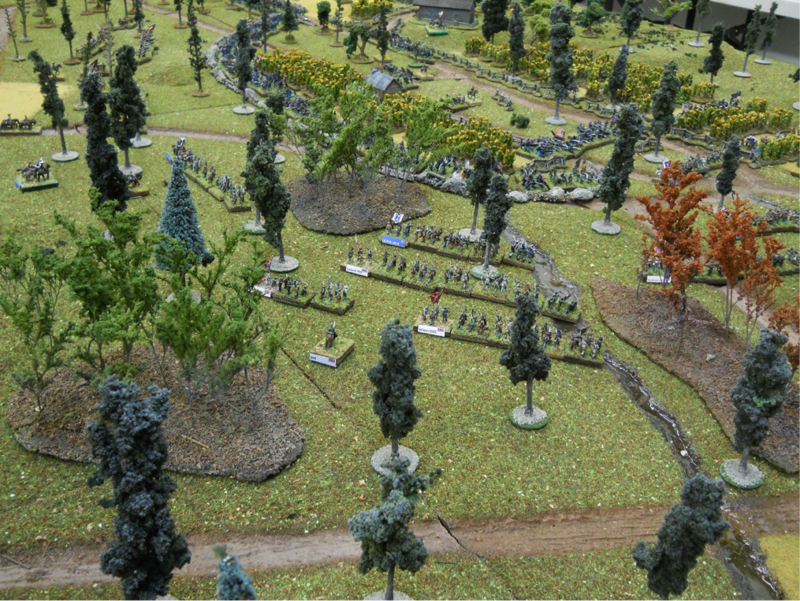 After temporarily gaining the works, they are almost immediately hit and forced back in the Yankee side of the same turn. 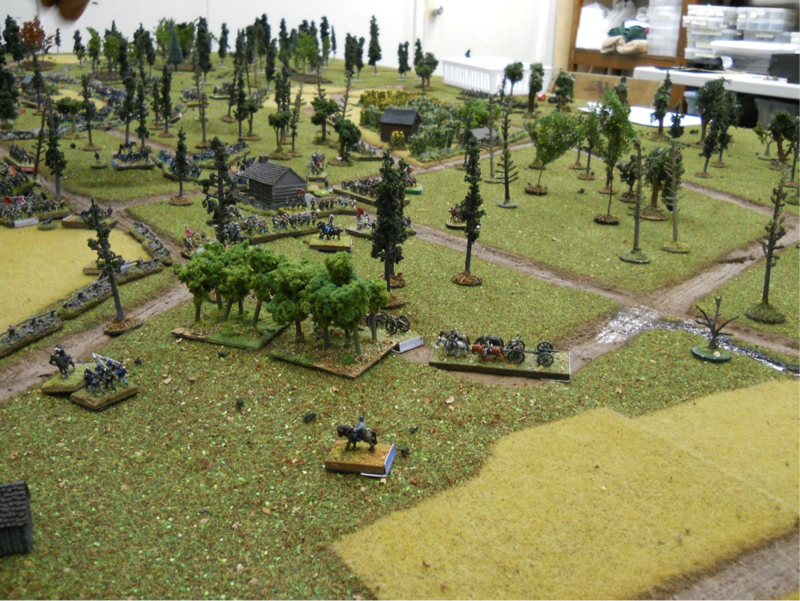 The Yanks now mount a counter-attack against the Rebs on Snodgrass Hill. 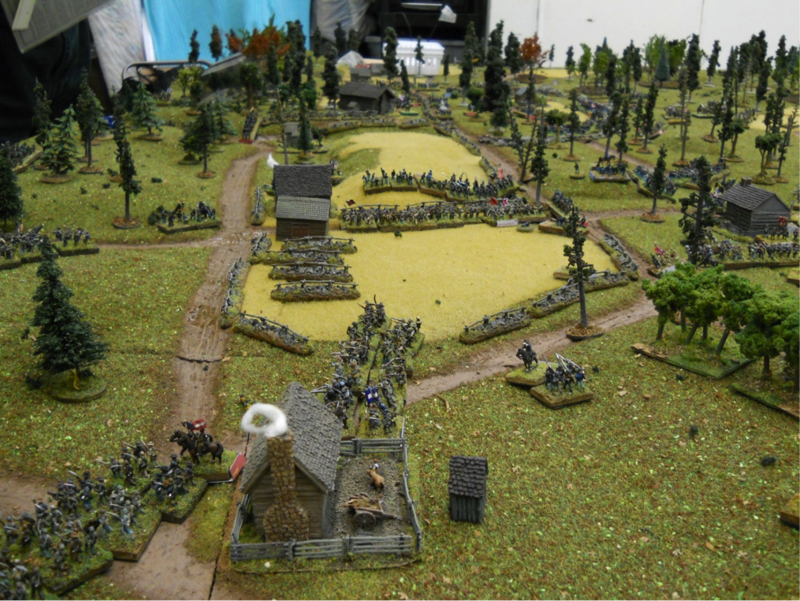 On the right the Yanks assemble a formidable gun line, which again saw the CS player lose three stands and the ensuing melee. Govan is surrounded atop Snodgrass Hill and is swept from the field. The hill is once again in Yankee hands. The CS attack in the center runs out of steam. Granger arrives and the CS players concede. Final VP tally is US 64 CS 44. Also of note was the capture of both Sheridan AND Forrest. Hope you enjoyed the AAR. We will run this again at Historicon. Prize: Bases or 10mm Figures your choice; No. of Players: 10. Man, what a positively beautiful table! Wish I had a "House of War" like yours nearby!